In a previous article, we explored the free 3D software that can be used in 3D printing (List of Free Software for 3D Printing). Actually, any 3D software can be used in 3D printing as long as it can save of export the model in STL format. Some 3D printers support other formats such as DAE and OBJ. If you do not have access to 3D software for printing, you can try the online 3D software or the browser-based applications that allow creating 3D models based on existing shapes or basic geometrics. Some of these online 3D software are free and other requires joining a subscription plan. These online 3D software are easy to access and compatible with different browsers and operating systems. Yet, it does not provide the quality and the complex tools and capabilities in professional 3D modeling applications. The online 3D software can extend the modeling tools and provide cloud storage and sharing the 3D models with friends through different of methods such Facebook, Twitter, and other social networks. Below are four browser-based 3D modeling software that can help non-expert to do 3D models quickly and download for further use in design or 3D printing using any of the formats discussed earlier. 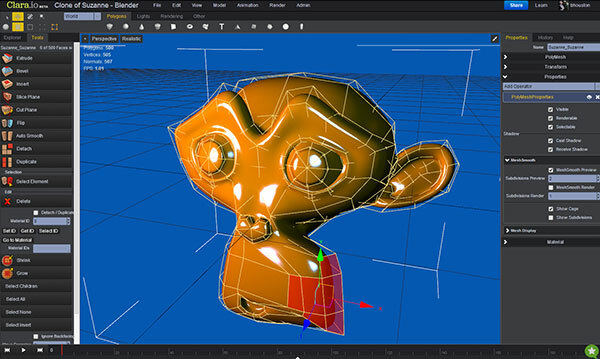 Project Shapeshifter is created by Autodesk to create 3D printable models directly on web browsers. Project Shapeshifter is easy to use and creates professional-look and high quality polygons by simply tweak sliders. Once you create the model you can download or share it with your team. Tinkercad is a browser-based 3D modeling application that provide its service based on different membership plans. The free plan unlock the 3D modeling tools and unlimited storage but does not allow team management features. Tinkercad is more directed to create CAD model for 3D printers and includes many 3D modeling tools such as solid modeling, grouping, importing 2D shapes, and special tool for SVG export for laser cutting. 3dtin is another online 3D modeling tool that includes the basic modeling features and includes number of 3D models that you can use as the base for the modeling.The interface is not professional if we compare it with Shapeshifter, Clara and Tinkercad.